Product Description This multi-sample osmometer tests up to 30 samples per hour, providing automated testing for laboratories that process moderate to high volumes of samples. The osmometer utilizes the freezing-point depression method, making it ideal for many clinical and industrial applications. 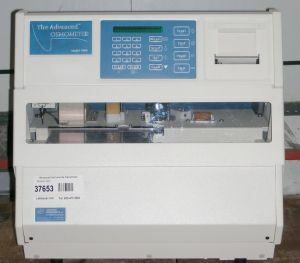 An on-board printer records test results with sample ID and instrument status. Microprocessor control facilitates automatic operation and calibration, as well as statistical analysis and management of the setup menu and troubleshooting routines. A supervisor key limits access to advanced functions. The unit features a frost-free cooling chamber to eliminate most routine maintenance. The sample probe is cleaned between tests to eliminate sample carryover.